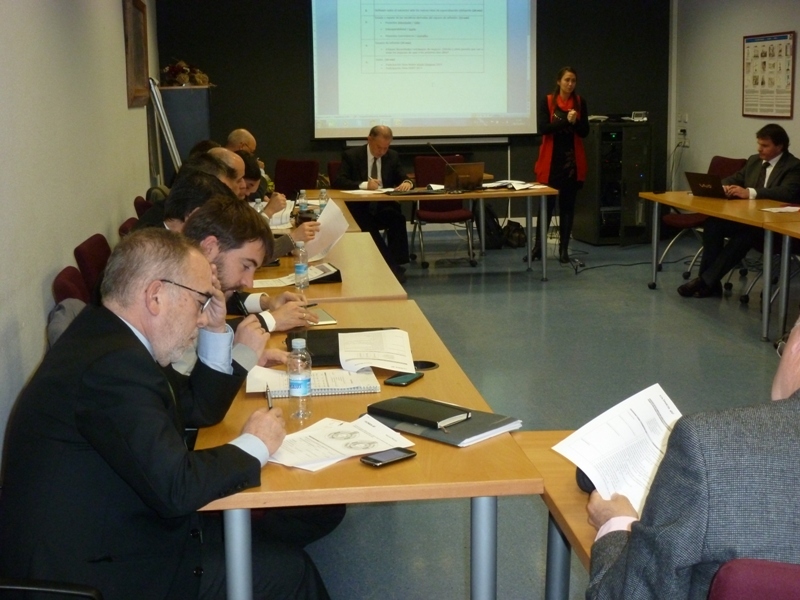 As part of the annual Smart City Expo World Congress held in Barcelona, Spain, every year, THE ORGANIZING COMMITTEE OF KYOTO SMART CITY EXPO plan on holding the event in Kyoto in order to promote exchange of smart city-related business and technology through establishing of a three pole network between Asia, Europe, and South America. Next Generation Cities and New Industries through "Green Environment"
Taking into account international trends for the creation of smart cities and development of new technologies and systems for the next generation, this symposium aims to identify what smart, slim, and comfortable cities should be, as well as provide directions for the creation of new industries that generate further business opportunities. Development of information and communication technology has fundamentally changed not only daily lifestyles, but also communication between people and social systems. It is increasingly important that we make the best use of information and communication technologies to make our lives more comfortable, as well as to create a more safe and secure society. In this session, we focus on advanced verification projects, aiming at construction of sustainable and smart social system for the next generation. Various programs to develop smart cities are being carried out throughout the world, aiming to solve a wide variety of problems facing urban areas. Urban transformation is underway at a high speed. This session focuses on urban development and its issues related to common issues such as energy, health, medicine, aging populations, food, disaster preparedness, which many regions are facing today. Realization of comfortable mobility is an important issue for the formation of smart cities. Amid the increasing world's population, coupled with concentration of urban populations, conventional road networks that have reached their physical limits have become a serious issue along with the problem of CO2 emissions. We are facing serious environmental problems caused by mass consumption of energy and natural resources as a result of economic growth. In order to solve those problems, we must continuously make efforts to change the way we live and work in our daily lives and economic activities as well as try hard to develop sustainable smart cities. In this session, we focus on the development of cutting-edge technology and systems and international standardization in green-growth sectors such as smart houses, smart buildings, and new energy resources. The InnoGrid 2020+ 3rd Annual Conference will take place in Brussels next 25th and 26th of March 2014. The event, organized by the European Distribution System Operators for Electricity (EDSO) for Smart Grids, the European Network of Transmissions System Operators for Electricity (ENTSO-E) and GRID+, will gather Researchers, Industry Representatives and Policy Makers who will assess the role of Research and Development in the electricity grids of the future. During the Conference, eleven Key Speakers will approach the status of EU funding opportunities and the challenges and the integration of new energy systems and consumers, among other topics. The InnoGrid 2020+ event starts on the 25th of March at 8h30 and concludes on the 26th of March at 16h30. For more information, visit the Conference’s website. But, as I wrote in our rankings of North America's smartest cities, our urban centers "demand 21st-century solutions to accommodate their growing populations in ways that not only maintain the quality of life, but also improve it. In short, smart cities are innovative cities." Without further ado, here is the top 10 smart cities for Europe in 2013. In fact Vienna recently created a public private entity, TINA Vienna which is tasked with co-developing smart city strategies and solutions for the city. They gave me a document which summarizes more than 100 smart cities projects being developed throughout the city. One cool project is the so-called “Citizen Solar Power Plant." With a goal of obtaining 50% of their energy from renewables by 2030, the city partnered with the local energy provider, Wien Energy, they developed a crowd-funding model whereby individual citizens can buy half or whole panels and receive a guaranteed return of 3.1% annually. Paris, most known for its fantastic museums and of course the Eiffel Tower, Paris has become a pioneer in the smart cities arena. Their most impressive initiatives have been in their complete embrace of shared mobility. Paris has led the world in their expansive and widely used bikesharing network, Vélib'. Currently, the system has more than 20,000 bikes and 1,800 bikes throughout the city. Evidence suggests that Velib has led to a 5% reduction in vehicle congestion in the city. Not to be outdone, the city partnered with Bolloré to create one of the world’s first and most expansive EV carsharing programs. Launched in 2011, Autolib will soon have 3,000 EVs in its carsharing fleet. In recent years, Hamburg has embarked on widescale transformation. At 157 hectares, HafenCity (Harbor City) is Europe’s largest urban regeneration project. When completed in 2025, this roughly billion project will house a university, a port, and lots of mixed-use residential and commercial development connected with excellent, green transit. The first South-East European Smart Cities event will focus exclusively on Intelligent Energy, Intelligent Mobility & Transport, Intelligent Emergencies Management and ICT, Intelligent Waste Management. Today, 80 % of the Europeans live in urban areas. Cities occupy only about 2% of the land area, but they consume 75 % of resources and emit 80 % CO2. It is really important to find ways to reduce this consumption and the pollution. The aim of this event is to demonstrate solutions that will help the urban systems to offer better and more efficient services for their citizens. Smarter cities not only improve the quality of life, but also decrease the bills and stimulate sustainable growth. From 25 to 27 February 2014 at the Nuremberg Exhibition Centre the focus will once again be on all things embedded systems: the embedded community comes together here in annual rotation at the embedded world Exhibition & Conference. As a leading international world fair with the focus exclusively on embedded technologies, it reflects the trends in the sector; around 900 exhibitors are presenting state-of-the-art covering all aspects of embedded systems. Come to Nuremberg at the end of February and discuss, work and learn together with the best the sector has to offer! Challenging conventional thinking at the 2014 ESC/EELive! Industry-leading engineers who have hands-on experience harnessing the forces and technologies reshaping embedded systems and the electronics industry will share their real-world experiences and teach EE Live! attendees how to streamline their product development efforts and transform their napkin sketches into business realities. Founders and top engineers from recent startups such as Orbotix, 8-Bit Lit, Adapteva, and Spark Business will discuss topics such as the software languages required to connect a device to the cloud (that are likely outside the embedded and electronics designer's skill set), open UI solutions for projects on a budget, and tricks for bringing firmware back to life. When they come together at EE Live! in San Jose, Calif., March 31 to April 3, these first-time speakers will change your perspective about what it means to be a design/systems engineer today. This Initiative will support cities and regions in taking ambitious and pioneering measures to progress by 2020 towards a 40% reduction of greenhouse gas emissions through sustainable use and production of energy. This will require systemic approaches and organisational innovation, encompassing energy efficiency, low carbon technologies and the smart management of supply and demand. In particular, measures on buildings, local energy networks and transport would be the main components of the Initiative. On 26 November, the CLINES European project, in which several technological organisations based in Europe take part, was presented to the GAIA companies in the Information Systems Committee. The project is aimed at boosting innovation and competitiveness of European businesses in the field of embedded systems technology oriented to smart cities, more specifically, to energy efficiency. At the presentation, preliminary tasks were carried out like the drawing of a road map including capabilities in the sphere of smart cities. In the first stage of the project, a knowledge map will be drawn of the regions involved, indicating what they are doing in the fields of smart cities. The city of Aalborg, in Denmark, hosted the first workshop of CLINES (Cluster-based innovation through embedded systems technology), a European project that gathers a number of European technology organisations aimed at boosting innovation and global competitiveness of European businesses in the promising domain of smart cities. CLINES will explore how embedded technologies can make cities smarter, with a focus on increased energy-efficiency. The 36-month project is funded by the European Commission through the 7th Framework Programme. Participating clusters include Brains Business (Denmark), BICC NET (Germany), GAIA-Cluster TEIC (Basque Country) and DSP Valley (Belgium). Among its partners are technology centres, universities and national agencies, such as Aalborg Universitet, Fundación Tecnalia and IWT (Flemish Agency of Innovation, Science and Technology). Help develop smart specialisation strategies in all regions, building on specific individual knowledge and following common cross-border action plans. In the first stage of the project, a knowledge map will be drawn of the regions involved indicating what they are focusing on in the domain of smart energy-efficient cities powered by embedded technologies. ‘Using the information on the map, we will prepare a working agenda that will help us go further to encourage business innovation and competitiveness at the global level in fields of high strategic interest,’ a member of the consortium said. The CLINES partners stressed that the next stages of the project will be essential ‘to boost economic growth by creating an innovation environment encouraging R&D into new technologies and products.